2002. Poster, 24 × 36 inches. 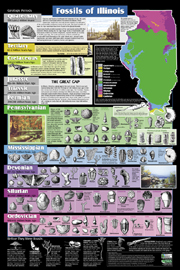 This colorful poster displays detailed drawings of common Illinois fossils by geologic period, color coded to match a geologic map of Illinois, making it easy to locate where in the state the rock of a given period is present at the surface. By Dennis R. Kolata and Rodney D. Norby. Illinois Fossils is a great size to display on office, family room, or bedroom wall. Side 1 is covered with beautiful photographs of museum-quality fossil specimens shown in high resolution. The key on side 2 provides additional information about those specimens. Also on side 2 are the answers to some commonly asked questions: What are fossils? Why are fossils so important? How old is that fossil? Where in Illinois are fossils from different periods found? 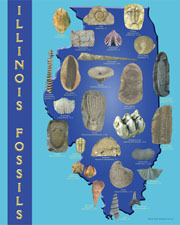 Some of the most common fossil types found in Illinois are discussed.